Welcome back. This month we move out of Chanthaburi city to Laem Sing district by the Gulf of Thailand. Laem Sing is endowed with natural beauty; a forest park overlooking the sea, a beautiful beach and two off-shore islands. It’s also home to some ruins of the past. Laem Sing district is about 30 km south of the Chanthaburi city. It’s located at the estuary of the Chanthaburi River which dissects the eastern part of the province, passes through Chanthaburi city before flowing out to the Gulf of Thailand. 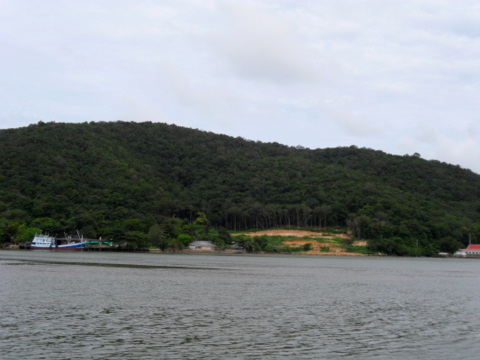 Laem Sing got its name from a huge rock at the estuary that resembled a lion. As the rock was on the tongue of land protruding from the east bank of the estuary, the place was called Laem Sing or Lion Cape. There’s a fishing port at the tip of the cape where fishing boats off-load their catch into a conveying belt where fish are packed into foam boxes for the market. 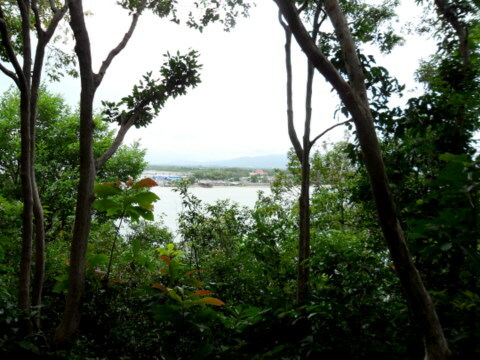 The major attractions at the Chanthaburi River estuary are the beautiful Laem Sing beach on the east bank and the Laem Sing Forest Park on the west. There are also two small off-shore islands; Ko Chula (Chula Island) and Ko Nom Sao (Maiden’s Breasts Island, don’t ask me why). It was peaceful on the beach that morning as we were the only visitors there. 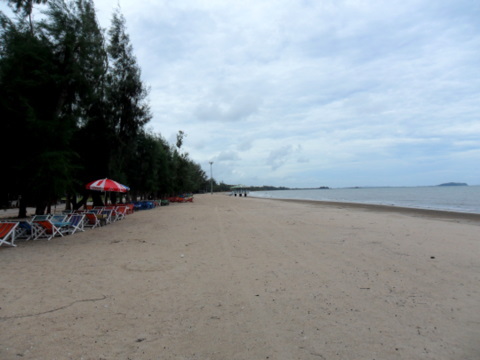 The beach caters mainly to weekend visitors from the city. The costly war with Vietnam over control of Cambodia in the reign of King Rama III dragged on intermittently from 1833 till it was finally over in 1846 when Thailand was firmly control of Cambodia. 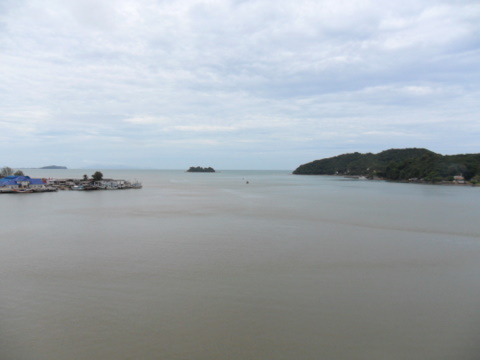 As Laem Sing was at the river mouth, two forts were built to prevent a Vietnamese incursion by sea and up the Chanthaburi River. Only the ruins of one fort remain today. The end of the 19th C gave rise to a new conflict, this time with the French colonialists in Indochina. When the territorial conflict erupted in Laos in 1893, French retaliated by sending gunboats up the Chao Phraya River to threaten Bangkok. 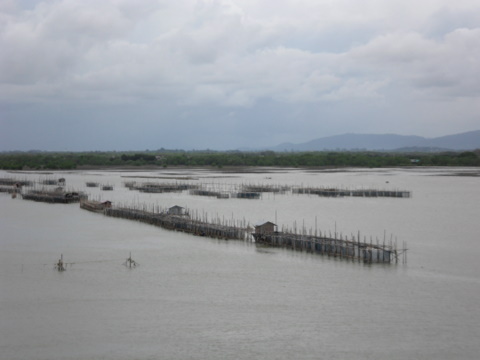 A blockade was also imposed at Paknam the river mouth. Thailand was forced to give up Laos and pay a heavy indemnity of 3 million francs. To ensure that these demands were met, the French occupied Chanthaburi and Trat from 1893 – 1906. A further demand was a 25 km demilitarised zone west of the Mekong which prevented Thailand from deploying troops in her own territory! It was a dark period in Thai history and there remains a grim reminder of the French occupation in Chanthaburi. The red single-storey building 200 m away from the estuary and fishing port was closed during my visit. There were no signboards to indicate what the building is being currently used for. The building is called Tuek Daeng, literally "red building" and it stands over the site of an old fort that is no longer exists. That fort, Pom Phikat Patchamit is one of the pair of forts guarding the river mouth. 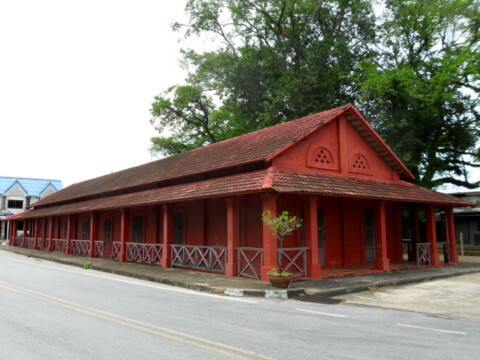 During the French occupation, Tuek Daeng was used as quarters for French officers. 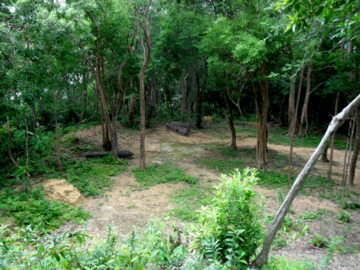 It’s a pity; Tuek Daeng would be ideal as a museum to preserve the history of Laem Sing. 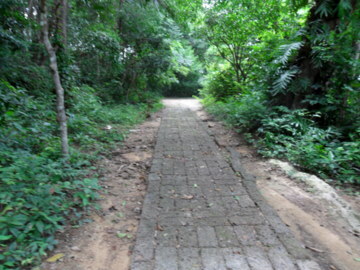 We crossed the long bridge at the estuary linking Laem Sing to the Laem Sing Forest Park on the west bank. When we got to the other side, we turned left and followed the road signs along the hilly road until we got to this stone path. 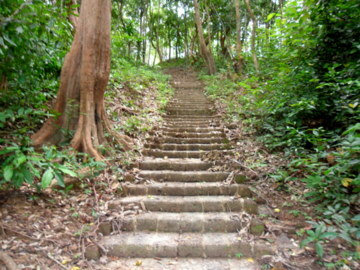 From there on we had to proceed on foot up a flight of stone steps which soon gave way to mere tree roots. 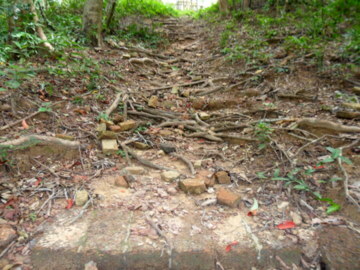 Little remains of the old fort except stone stumps. 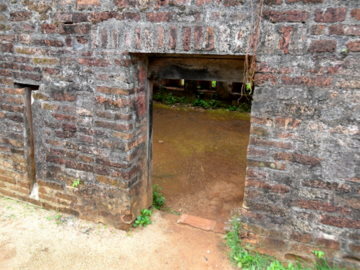 The fort was built in 1834 in the reign of King Rama III to counter a Vietnamese naval threat. It was only in 1857 during a royal visit by King Rama IV that the fort was named Pom Phairi Phinat or Fort Phairi Phinat. 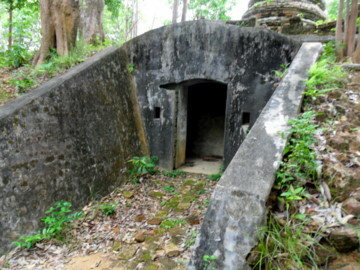 It’s one of the pair of forts guarding the entrance to the estuary, the other being, Pom Phikat Patchamit in Laem Sing. 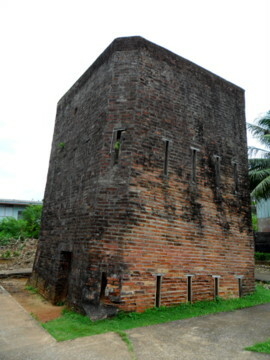 That fort however was completely destroyed and Tuek Daeng, the red building stands on the site. I cautiously peeked into what looked like a concrete bunker. But it was just a small space probably for ammunition storage. But the structure that caught my eye was up on a hillock in the centre of the ruins. 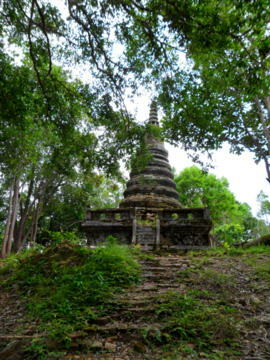 It was an old crumbling chedi on the verge of collapse, held up by timbers. 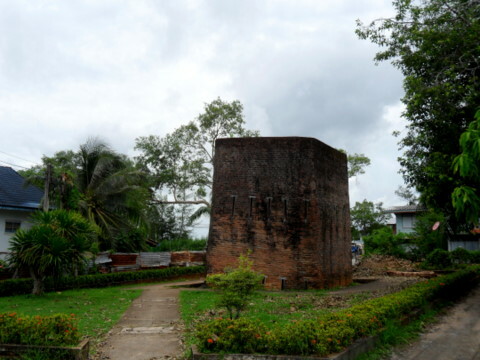 This chedi was built in 1904 at Fort Phairi Phinat to celebrate the signing of the treaty for the French withdrawal from Chanthaburi. 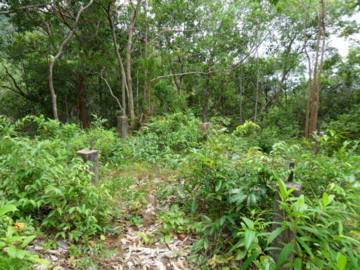 It was built on the site of an old chedi built earlier by the Governor of Trat. Appropriately the new chedi was named Chedi Issaraparb or the Freedom Chedi. Despite the 1904 treaty, the French didn’t withdraw from Chanthaburi until 1906. The French occupation of Chanthaburi was naturally met with resentment and resistance. Some openly rebelled. Those who were caught were thrown into this prison which was built in 1893. 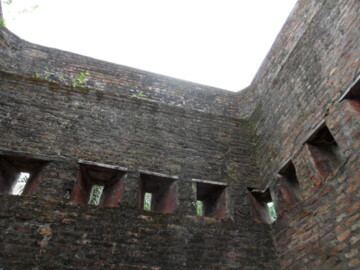 The prison consisted of a brick tower 4.4 m square and 7 m high with two rings of ventilation slots around the tower. One had to bend to get in the low, narrow door at one side. The top of the tower however was open and it wasn’t for ventilation. Wire mesh was placed over the top of the tower where chickens were reared. 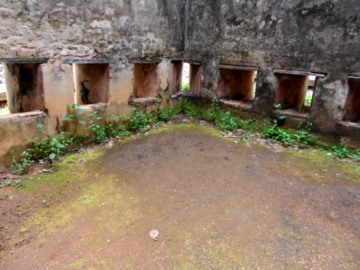 The chicken droppings fell constantly on the prisoners below, adding to the misery of their imprisonment. I have no idea what the French called this prison. But the Thais gave it a name to ensure that posterity will not forget the inhuman treatment the French meted out to their captives. They called the prison Khuk Khi Kai or prison of chicken droppings. This signboard just next to the old prison site, adds the final twist of irony. Switch to the satellite or Google Earth version on the map to get a 3D view of the places. To get to Chanthaburi city take a van from the Victory Monument in Bangkok. The van station is near the junction of Soi Ratchawithi 10 where the Fashion Mall is located. The fare one way is 200 baht. The van will go all the way to the Chanathaburi city centre and terminate at the station behind KP Grand Hotel. From Chanthaburi city you can either charter a motor-cycle if you’re alone or a "song taeow" (pick-up). 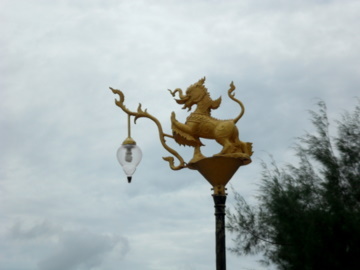 There are white "song taeow" plying between the city and Laem Sing. Agree on the fare first. 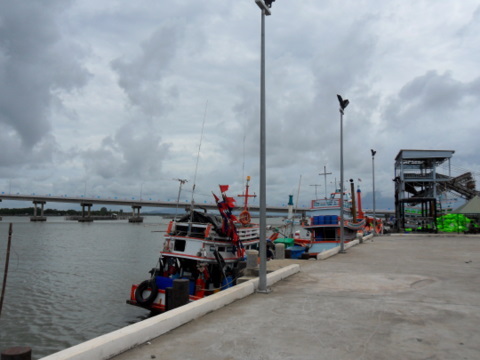 Samut Sakhon – fishermen’s wharf in the "Chinese port"